It’s inevitable: The elements will eventually wear down your chimney, leaving it damaged and more vulnerable to leaks or a crumbling chimney structure. If the bricks and mortar of your chimney are deteriorating, it’s wise to have them tuckpointed in order to restore their integrity and resistance to weathering. Here at Chimney Care Plus, we provide chimney tuckpointing services will improve the exposed surface of your chimney’s exterior. We can restore the brick surface, as well as the mortar between your bricks with specialized tuckpointing techniques. If you’ve noticed that your chimney has bricks that are falling apart or mortar that is caving in, then it’s time for a restoration. Reach out to your chimney repair pros here at Chimney Care Plus. We provide tuckpointing services and chimney rebuilds for folks throughout Frederick and the surrounding counties, and we’d be ecstatic to make sure that your chimney looks great and performs well, even in heavy storms. You can also continue reading to learn more about tuckpointing and to find out the answers to various common questions that we receive. Tuckpointing is a technique that can be used to extend the life of a brick surface. When brick and mortar surfaces are damaged, they slowly lose their waterproof quality. Eventually, these surfaces can become so deteriorated that they may crumble and fail. Fortunately, masonry can be rebuilt, or it can be tuckpointed to make the brickwork appear as if it were brand new. Now, tuckpointing is different then tearing off and rebuilding the masonry. Instead of replacing bricks, the mortar is applied to the existing brick surface. When tuckpointing, we’ll use two types of mortar to adhere to the surfaces of your chimney structure — one mortar that is the same color as the mortar between the bricks, and one mortar that mimics the natural color of your bricks. Essentially, we create a facade of mortar over your bricks to mirror the original look of your chimney, while providing better waterproofing protection and added support to the structure of your chimney. We use strong tuckpointing mortars that are designed to resist wear and tear that can be caused by precipitation and wind. Why should I tuckpoint my chimney? Tuckpointing is designed to extend the life of your chimney. This measure will help to keep your bricks from exposure to the elements, which can cause the structure of your chimney to fail. Rebuilding your chimney may be more expensive, so it’s advisable to have your chimney tuckpointed before it becomes too problematic. You will save money down the road, and you won’t have to worry about your chimney crumbling and becoming a hazard. When should I rebuild and when should I tuckpoint? Tuckpointing should only be performed if your chimney’s bricks are still relatively intact. If your chimney is crumbling or significant portions of the bricks are missing, then demolition and rebuilding may be necessary. If more than an inch of your bricks’ surfaces are missing, then a rebuild may be in order. Also, if the bricks of your chimney are loose, its an indication that the mortar has failed, which means that you should have your chimney rebuilt. If you’re curious about the state of your chimney, we can stop by for an inspection, and we’ll let you know about the best plan for your situation. How long does tuckpointing take? Tuckpointing can be usually be performed in a couple of days. We’ll have to grind down the surface of your bricks to reach a surface that is undamaged. From there, we can apply a fresh layer of mortar. If you’re curious about how long your project will take, feel free to get in touch with us — we’d be happy to work with your schedule. Rebuilding your chimney can be completed in a matter of days. Since we may have to demolish and remove material before we get started, this masonry project may take multiple days. We can install a chimney cap and crown while we’re working on your rebuild. Again, if you’d like to know how long your project will take, just reach out to us and we’ll provide you with a scheduling estimate. Can tuckpointing be performed in colder temperatures? Yes. However, tuckpointing is easier when it’s warm, since the mortar requires temperatures above 40 degrees Farenheit in order to solidify properly. In extreme cases, we may use a heater or other techniques to tuckpoint your chimney during the colder months of the year. Can bricks be laid during winter? Yes. Like tuckpointing, it is ideal to lay bricks during the warmer months (in temperatures that are above freezing), however we can perform brick laying in the winter with the aid of heaters or other measures. We may advise you to wait for warmer weather if your chimney doesn’t require immediate repairs. Tuckpointing usually costs a couple hundred dollars, depending on the amount of damage and the dimensions of the surface to be repaired. This figure includes material costs and labor, including grinding the brick surface as well as the tuckpointing itself. We’d be happy to give you a quote for your specific project. Tuckpointing can last for decades on end, and its lifetime is similar to that of the mortar that already exists between your bricks. You can expect your tuckpointed surface to last for two decades or more. How often should my chimney be tuckpointed? Chimneys tend to last between two decades and a century before they may deteriorate enough to require tuckpointing, though that figure will depend on the amount of exposure your chimney receives, and the quality of the bricks used in your chimney construction. If you’ve noticed that the surface of your chimney is no longer flat and uniform, then it may be time to tuckpoint that surface. You may also notice that the mortar of your masonry has deteriorated (since it tends to deteriorate more quickly), in which case you may need tuckpointing services earlier. Mortar tends to last two to three decades, depending on the conditions. Will my chimney look different after being tuckpointed? Somewhat. While we make an effort to ensure that your chimney looks just as it did when it was built, the mortar used to mimic the brick color of your chimney will likely be slightly different from the bricks themselves. Your chimney will still look as if it were brand new, however the coloring may be a bit different. Tuckpointed surfaces may be painted, or siding can be added to your chimney if you’d like to change its look. How else can I protect my chimney, moving forward? If your chimney doesn’t have a chimney cap or crown, we’d recommend that you have us install one while we’re up on your roof. 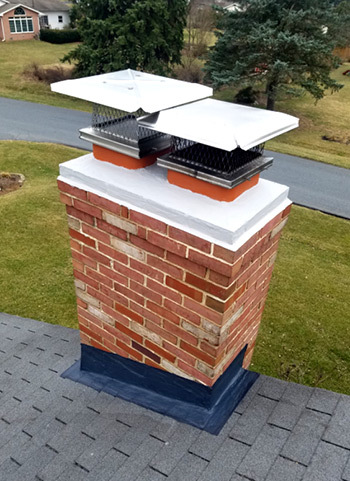 A chimney crown is a cement layer that is applied to the top of your masonry, providing your chimney with better defense against falling precipitation. The crown of a chimney can also be restored if it is deteriorating, by adding an additional layer of mortar or cement. A chimney cap may also be installed above the opening for your chimney to keep water from falling onto the crown or down through the flue (the chamber through your chimney). Chimney caps are metal components that are usually prefabricated, which can be attached to the top of your chimney. If you already have a chimney cap that is rusted, damaged, or falling off of your chimney, we’d be happy to replace it with a new component. If your chimney is looking a little worse for the wear, we can rebuild it or tuckpoint its surfaces to provide lasting protection. We aim to ensure that your chimney won’t leak or fall apart anytime soon, so you can trust that it will stand for decades on end. If you can’t tell whether or not your chimney needs tuckpointing or rebuilding, we’d be happy to stop by for an inspection. We also provide a myriad of other repairs, from cap rebuilding to crown replacement to flashing installation, so that your chimney is whole once again. If you're ready to get started, simply give us a call — again, we provide tuckpointing services and chimney rebuilds for folks throughout Frederick and the surrounding counties.